Zaheer Khan has been one of the outstanding bowlers in world cricket for some time now. He has a good recent record against England and after removing Andrew Strauss and Alistair Cook at a personal cost of just 18 runs in the first Test at Lord’s he must have been looking forward to, at the very least, finishing the current series on a personal high in the ICC Rankings. It was only after Zaheer pulled up lame half way through his fourteenth over at Lord’s that England began to assert themselves, and the first Test started to drift away from India from that moment on. Many believed that without their spearhead India would struggle, although initially those doubters seemed to be a little way wide of the mark. Even as Zaheer sat, dejected, in the Lord’s dressing room one of his understudies, Praveen Kumar, was sticking to his task and ended with a well deserved five wicket haul. Kumar moved the ball both ways and coaxed some life out of the Lord’s pitch in much the same way Angus Fraser did at his best. Kumar also qualifies for that, on the face of it nonsensical description, of being quicker than he looks – it may not make much sense, but everyone who has played the game knows what it means. Fortunately for England Kevin Pieterson in their first innings, and Matt Prior and Stuart Broad in the second, after the depleted Indian attack tired, managed to take the game out of sight but not before Ishant Sharma became the second of Zaheer’s colleagues to step up to the plate as he produced a superb spell on the morning of the fourth day to rip out England’s top order. Bowling with a great deal of aggression, and at a distinctly sharp pace, the tall gangling Sharma looked a different bowler to the one who had toiled wicketless through the England first innings. For the second Test at Trent Bridge Sreesanth was drafted in to join Sharma and Kumar and as England slumped to 88-6 the enfant terrible of Indian cricket weighed in with three good wickets. I have never fully understood why some Indian fans have a problem with Sreesanth. Being brash and aggressive strike me as good qualities for a young fast bowler to have and, now 28 and hopefully free of injury, he perhaps ought to be entering his prime. Sadly for India the scorecard never got better than 88-6. The bowlers couldn’t prevent Stuart Broad marshalling the England tail to add another 133 precious runs and after Sharma and Sreesanth removed the England openers cheaply in the second innings they and Kumar could not rein in the middle order as England built up a match winning lead. The efforts of the Indian pace attack in the third and fourth Tests I am sure they would rather forget, so I will not dwell on their figures here. Despite India’s woeful performance this summer the fact remains that in addition to Zaheer they can field, in Kumar, Sharma and Sreesanth, three pace bowlers who have the potential to put in a match winning performance even when their leading man is out. This would have been unthinkable when I started watching cricket, and shows how much the game on the sub-continent has changed in the last forty or so years. The English summer of 1967 is the first I can just about remember, as far as cricket is concerned anyway. India were easily beaten 3-0 in a three match series. John Snow was England’s spearhead then, and a very good one he was too. In the first Test India countered him with Subrata Guha and Rusi Surti. Surti was definitely no more than medium pace, Guha a tick over. Guha’s entire career brought him just three Test wickets and while Surti was more successful his 42 wickets cost almost 50 runs each – realistically his batting was his stronger suit. In those days India’s lack of depth in the pace bowling department was best illustrated by what happened in the third Test of that series when Guha and Surti were both injured. The opening bowlers were Venkataraman Subramanya and Budhi Kunderan. Subramanya was a batsman who bowled some half-decent leg spin that was good enough to get him 70 wickets at 44 over his First Class career, but he bowled medium pace in that match at Edgbaston. As for Kunderan he was the tourist’s reserve wicketkeeper, albeit a good enough batsman to gain a berth in the side despite failing to displace Farokh Engineer behind the stumps. The four overs of medium pace that he bowled at the start of England’s first innings were the only ones he bowled in his 18 Tests. In the second innings Indian skipper Pataudi, another medium pacer, tried a couple of overs in order to get a bit of shine off the ball before India’s great spin combination of Bishen Bedi, Bhagwat Chandrasekhar, Erapelli Prasanna and Srinivas Venkataraghavan took over. It was the only time the famous quartet ever played together – India still lost but they did dismiss England twice. The next I saw of India was when they famously won in England in 1971, but things had not changed much in their pace bowling department. Syed Abid Ali, a burly medium pacer and hard hitting batsman opened the bowling with Eknath Solkar. Abid Ali, to be fair, could move the ball around in favourable conditions and in the second Test he made a mess of England’s top order, but his career average was still north of 40. Solkar was just a trundler. He started out as a slow left arm bowler but realising he couldn’t possibly compete with Bedi he took to bowling medium pace and that additional “skill” was enough to persuade the selectors that he was worth a place. He was a decent lower order batsman and, perhaps most significantly given India’s reliance on spin bowling, one of the finest close catchers the game has seen. By 1974, when India came here next normal service was resumed as England again won 3-0. It was still Abid Ali and Solkar who lead the attack albeit Madan Lal, another medium paced all-rounder, joined them for the first two Tests. Madan Lal was a little bit quicker, and played Test cricket for more than a decade, but could still not get his career bowling average below 40. India next visited these shores in 1979 for a series of four Tests after the second World Cup. The tourists had a dismal time in the Cup, and lost the Test series 1-0. They were nowhere near good enough in the drawn second and third Tests although they very nearly squared the series in the last Test when, with two wickets to fall and ten runs required, they just failed to chase down 439 for what would have been a remarkable victory. There was however one thing about the 1979 Indians that was different. They had a strike bowler, the 20 year old Kapil Dev. Kapil led the Indian attack into the 1990s and while he was not express pace he was a genuine fast medium and, as importantly, had the aggression that was so lacking in his predecessors. It was unfortunate for India that they could not find anyone similar to bowl with Kapil. His opening partners included Madan Lal, Manoj Prabhakar and Roger Binny, all just a little over medium pace. For a while Chetan Sharma, not far short of Kapil in terms of pace, looked like he might be his long term partner but after five years he dropped out of the Test side. In the last couple of years of Kapil’s career, by which time he had lost much of his effectiveness, he was finally joined by another fine bowler, Javagal Srinath, who was destined to lead the Indian attack for a decade. Like Kapil had been Srinath was largely on his own, partnered at first by Prabhakar and latterly by the pretty ordinary Ajit Agarkar and Ashish Nehra. In 1996 a new partner, Venkatash Prasad, was the world’s leading wicket taker but he failed to maintain that momentum and played his last Test just five years later – he was not, in any event, particularly quick. Like Kapil with Srinath, at the close of the latter’s career, he played a few Tests with his successor, Zaheer who, fortunately for him, has as noted found rather more support than his predecessors. So has there ever been a time for Indian pace bowling to rival the present? There were three post war tours of England that I am too young to remember those taking place in 1946, 1952 and 1959. England won the three series 1-0, 3-0 and 5-0 respectively and of the three drawn matches (two in 1946 and one in 1952) rain saved India from inevitable defeat in two and only in the final Test of the 1946 series can they be said to have emerged unscathed, but only one innings was completed in that match. In 1946 the only effective seam bowler India had was Lala Amarnath, father of Test batsmen Mohinder and Surinder. In 1952 two of the three Indian seamers, Gulabrai Ramchand and Dattu Phadkar, paid more than 70 runs apiece for the seven wickets they took and the third, Ramesh Divecha, was not a great deal better his four wickets coming at a cost of 162 runs. It was a little different in 1959 in that India’s leading seam bowler, Surendrenath, enjoyed a good summer despite the rout in the Tests as he took 16 wickets at just 26. His opening partner, “Tiny” Desai, also took a dozen wickets although they were expensive, coming at more than 50 runs each. Of those mentioned the two most successful, Amarnath and Surendranath, were only medium pace. Desai and Divecha were faster, as for a time was Phadkar, but none of them came remotely close to being genuinely quick. So, realistically, it seems clear that Indian pace bowling, having started from nowhere, has slowly got better before, in the last decade or so, improving out of all recognition to a point where, currently, it has a quality and depth not previously seen. That said let us not forget that India, pre-partition, did play seven Test Matches, all against England, before the war. England won five of them comfortably, were well on top in one of the draws and in no danger in the other yet I cannot help but think that, were they available today, India’s earliest strike bowlers, Mohammad Nissar and Amar Singh, would give Kumar, Sharma and Sreesanth cause to fear for their positions, and perhaps Zaheer as well. Looking at Nissar first he had a high action with a rhythmic approach to the crease and was said to generate great pace from his powerful shoulders. He was able to swing the ball both ways without a perceptible change of action and made full use of the width of the bowling crease. In 1932 India played only one Test which, in the end, England won comfortably but there was a sensational start as they were reduced to 19 for 3 with Nissar dismissing the Yorkshiremen Herbert Sutcliffe and Percy Holmes, who only 10 days earlier had shared a record breaking opening stand of 555 in the County Championship. Although Douglas Jardine and Les Ames rebuilt the innings Nissar returned to claim the wickets of Ames, Walter Robins and Freddie Brown to cap his debut with a five wicket haul. Sir Neville Cardus said of him “Nissar’s speed during half a dozen overs was really capital; in every over we saw half hit, defensive strokes, untidy and uncertain”. In its report on the match The Cricketer confirmed that while the Indian outcricket was generally of a high standard (the same could not always be said in years to come) wicketkeeper Janadan Navle had missed opportunities. Irritatingly when the chances went down is not specified, but had the Jardine/Ames stand not flourished on that first morning who knows what might have happened. Whilst his debut was to remain his most memorable performance Nissar played in five of the other pre-war Tests against England in all of which he enjoyed some success, and on two further occasions, albeit in not quite so spectacular a fashion, he was to take five English wickets in an innings. Overall Nissar’s short Test career brought him 25 victims at an average of 28 runs apiece, and had there been some support for him and Amar Singh in those pre-war days then India may not have had to wait until after the Second World War for their first victory. Nissar’s finest achievement with the ball, despite his successes against England, came in the unofficial “Tests” played by Jack Ryder’s Australian side in India in 1935/36. He took 32 wickets in the four matches at an average of only 12 and was described by Ryder as “one of the finest fast bowlers in the world”. The Australians were not at anything like full strength, but could still call upon eight Test players, so India’s achievement in drawing the series of four representative matches 2-2 was a notable one. Had Amar Singh been able to play in the two games he missed, given that he took ten wickets in the two he could play in, then the result may have been even better for the home side. Altogether in First Class cricket Nissar took almost 400 wickets at just 17. His First Class career effectively ended at the conclusion of the 1941/42 domestic season in India, although he reappeared subsequently on three occasions his last appearance being as late as 1953 when, aged 43 he failed to take a wicket for Railways against Punjab in the semi final of the Quaid-E-Azam Trophy in what was by then West Pakistan. He died at the age of 52 in Lahore in 1963. As far back as 1935 he had had the dubious pleasure of reading his own obituary, it having been widely reported that he had died in the devastating earthquake that hit Quetta in May of that year. As for Amar Singh he was recognised by all who came up against him as a cricketer of the highest class and in a different age he would doubtless have ended his career with impressive figures. He was a tall man with a superb athletic physique and his long arms and high action generated sideways movement and, his most talked of quality, an ability to gain pace off the pitch. Sir Neville Cardus wrote of him “He swung the new ball now inwards, now outwards. His pace from the ground was vivid. A short run, a sudden rush of energy, loose wheeling arm and the ball flashed down the wicket like a javelin”. Singh was no one trick pony though. As a batsman he was always aggressive and hit the ball extremely hard. He was a fine slip fielder as well, and one of the most popular cricketers of his day. His older brother, Ladha Ramji, was also a fine fast bowler and that may have contributed to the Indian selectors, after the briefest of trials, deciding to risk taking him, at just 21, to England for the 1932 tour. Singh dismissed Walter Hammond, Ames and Sutcliffe in the Test and also recorded what was to prove his only half century at the highest level. When Jardine’s England side visited India in 1933/34 Singh bowled well throughout the series and took 13 wickets in the three Tests, but his greatest achievement with the ball came in the Lord’s Test of 1936. India were dismissed in that game for 147 and it appeared that England were going to coast to victory but Singh had other ideas. He took 6 for 35 from 25.1 overs as England were shot out for 134. Sadly his colleagues could not conjure up the victory that his bowling deserved but his performance was rightly lauded by all who were there to witness it. The 1936 tour of England marked the end of the Test cricket that Amar Singh and Mohammad Nissar would play but it is worth mentioning that India played five representative games against a strong English side raised by former Test captain Lionel Tennyson in 1937/38 in which Singh took 36 wickets at 16 runs apiece, his contribution being the main reason why India were able to win two of those unofficial tests. Tennyson’s English side was considerably stronger than Ryder’s Australian combination of two years earlier and had Nissar, who was only able to play in three of the matches, maintained form and fitness then again the result might have been different. Despite his achievements the abiding impression of Amar Singh has always been that of an unfulfilled talent. 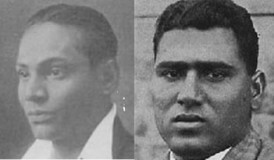 The Second World War may, in any event, have brought down the curtain on his Test career but it is still one of the game’s tragedies that he died of Typhoid in 1940, aged only 29, and that cricket missed what might have been his best years, and had a 36 year old Amar Singh been with his country in England in 1946 then just maybe he and Lala Amarnath might have combined to reverse the trend away from pace bowling that was to influence Indian cricket for the next two generations.